LA County Sheriff Lee Bacca won’t be winning any managerial or humanitarian awards any time soon. Ticklethewire.com has reported on Baca before. He has been accused of allowing a culture of violence and inmate abuse run rampant in LA prisons. And the Sheriff previously expressed anger that the FBI smuggled a cell phone to a prisoner acting as a mole to investigate claims of abuse. 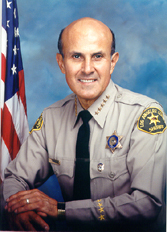 Now, reports the LA Times, an ACLU report has documentation of dozens of cases of abuse under Baca’s jurisdiction. “If he were a CEO, he’d have been out a long time ago,” former assistant special agent in charge of the FBI‘s Los Angeles office Tom Parker told the Times. “To an astonishing extent, unchecked violence, both deputy-on-inmate and inmate-on-deputy, permeates Men’s Central Jail and Twin Towers Jail,” he wrote. Posted: 10/17/11 at 9:13 AM under FBI, News Story.